Description : Cod Liver Oil is a natural source of vitamin D and A and assists in the absorbtion and use of calcium and phosphorus. Vitamin A and D help to maintain bone health and immune .. Description: May help to promote calcium absorption May help to maintain adequate serum concentrations of calcium and phosphate. May play a crucial role in the normal mineralization of bone.. Description: May help to promote calcium absorption May help to maintain adequate serum concentrations of calcium and phosphate. May play a crucial role in the normal mineralization of bone. Ma..
HI DEE 8 S GEL CAP Vitamin D3 (Cholecalciferol) 50000 IU Soft Gel Capsules. .. Supports: Strong Bones & Teeth Neuromuscular & Immune Health Vitamin D3 is an essential nutrient that works with Calcium to help develop strong bones and teeth. 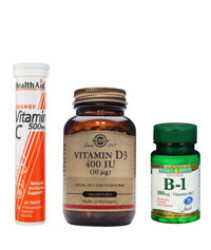 Vitamin D3 also supports .. Description : Pure enough to swallow, Vitamin-E Oil provides antioxidant and immune support. When applied to the skin, Vitamin E can help maintain your skin’s natural moisture, which contribu.. Description: Calcium is an essential mineral needed every day for proper health. * 99% of the body’s calcium can be found in the bones and teeth. This mineral provides the building blocks that help..
Vitamin C is one of the most well-known and widely used nutritional supplements on the planet! People reach for Nature' Bounty Vitamin C to help them get the essential benefits their body relies on e..
Get 10 oranges worth of vitamin C in one Redoxon effervescent tablet. * Available in great-tasting orange and lemon flavours, Redoxon tablets provide vitamin C that can help you maintain good health ..